Hi everyone! After a short break, I’m back with another easy DIY for you! There are so many DIY posts for homemade beauty products out there, and here are two of the easiest. The lip balm and scrub are made with 100% natural ingredients, including some from your backyard. No flower’s or herbs in your yard?…I bet the neighbor won’t mind if you return with some lip balm or sugar scrub! Both of these crafts would be great to make for a bridal or baby shower, or if you’re just having a “girl’s night”…and I’m pretty sure that some Sangria would be a perfect pairing! I’m not going to lie, champagne was an essential “ingredient” in my crafting process. Strain petals if you wish, I left them in, they look really pretty! Let cool completely (couple hours) and they’re ready to use! *Since this recipe uses beeswax (melting point is 145 degrees fahrenheit) it will harden enough to put into empty tubes. Mix together, and you’re done! How easy was that? *This recipe is really versatile, add whatever herbs, spices, flowers, zests, and essential oil combinations you prefer! We hope you enjoy these homemade beauty products as much as we do. If you decide to create either of these crafts, or any of the craft projects that we share with you, please feel free to share your finished product with us on our Facebook page! Have a craft idea you’d love to share? We’d love to mingle with you on Pinterest too! The lip balm recipe looks like it’ll make a really nourishing and moisturizing balm. I would definitely consider giving it a go, even though I have little experience with making homemade bodycare products. It’s really easy to make. Give it a shot! How do you store the lip balm diy product? Hi, Christine! You can store the lip balm at room temperature for about three months, but use your best judgment. I hope you like it! 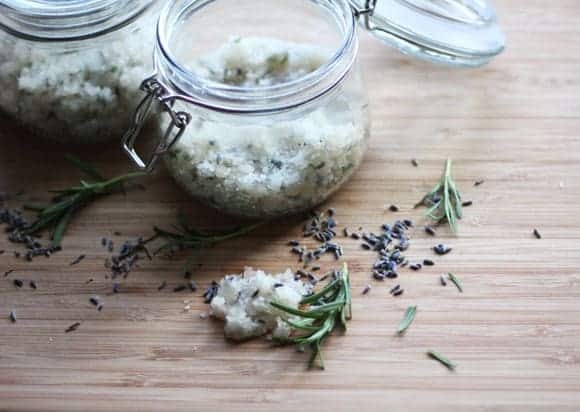 We love the lavender and rosemary scrub. we have so much of it growing in the garden, we need new uses for it. That coconut rose lip balm sounds amazing!! This is great. I have a few DIY recipes in my blog but I need to get more. I love the sugar scrub, so easy…I need to make some ASAP!! I bet that sugar scrub smells divine! I love lavender. SO loving these DIY!! Have any for shampoos, conditioners, moisturizers, or body lotions? Pinterest is full of good ones! What a fab idea! I’ve made some lip balms just like this for christmas gifts. I used candy sprinkles as decoration instead of flowers, which worked out just as fab! I’ve made my own lip scrub before and it was lovely! 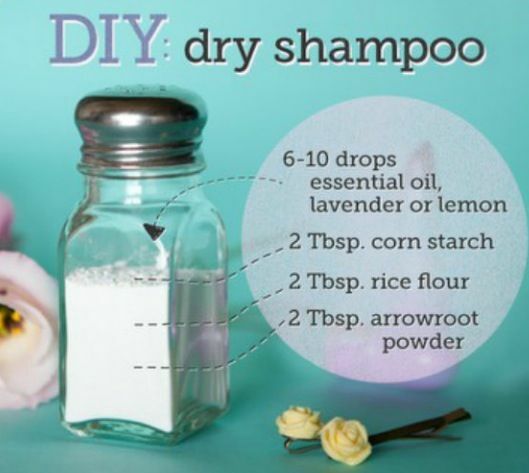 I adore the ideas of making homemade beauty products; so natural without all the harsh chemicals. I can’t wait to try these two! I’m always looking for a good lip balm – thanks for the recipe! Fun! 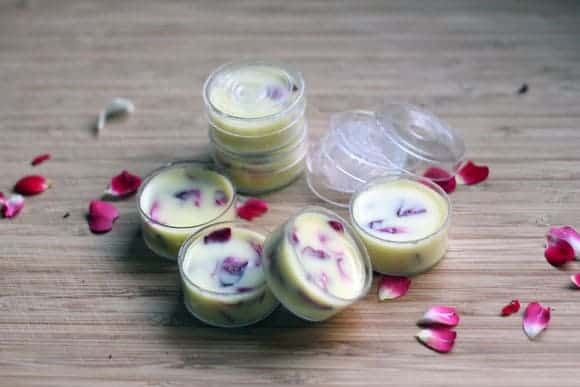 LOVE the idea of homemade lip balm! Shea Butter in recipe, is that pure Shea Butter? i live in UK so it is not that easy to find it. It is pure Shea Butter, you could substitute Cocoa Butter or Coconut Oil. If you sub Coconut Oil I would also up the Beeswax to make sure you still get a firm consistency. How long will the body scrub keep?? Oh, that´s great! Such a gorgeous idea. The lip balm will make my best friend a nice present! I made Mint Sugar Shine© lip gloss.came out nicr than my other ideas! Where did you find the containers for the lip balm? Thanks! Can’t wait to try these! Thanks so much! I got the coconut oil and extracts at the grocery store, and the beeswax and shea butter came from hobby lobby (in the soap and candle making aisle). You can also buy empty lip balm tubes on Amazon, which I really want to do next time! Let us know how you like the recipe! I love this! Going to try it but I have one question. Is the coconut oil cooking oil? The sweet almond oil is not for cooking right? 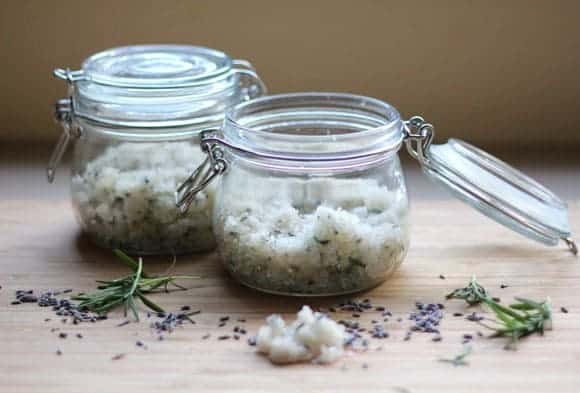 Just wondering because last time I went to the health food store to make my own scrub she was saying there’s oils for cooking and others for your skin, so just a little confused on which one to use. Thanks! Coconut oil is the same that you would use for cooking. Sweet Almond oil is not used in cooking, you can find it at craft stores in the soap/candle making sections. Hope this helps! I tried the lip balm today, love it! One question, did you do anything special to get the vanilla extract to blend with the coconut oil? I had trouble with the old oil/water dilemma. I just heated it slowly and stirred a lot! Thanks so much! What size were the containers you used for these rose lip balms? 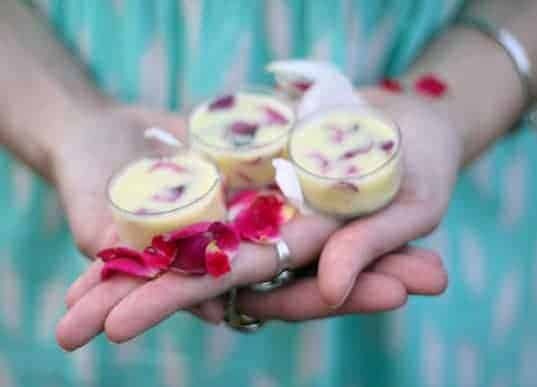 I want to make this but I am only seeing .2 oz containers online and want to make sure my little pots are big enough to really showcase the rose petals. Such a wonderful project! The containers that I used were about 1/2 oz. They were something that I found that had measuring tapes in them at Michaels. Is there any way to substitute the coconut oil with something else? I’m not a big fan of coconut! You can use olive oil instead but you will need to play around with the proportions and add more beeswax since olive oil is not solid at room temperature. Thanks so much! do you have some suggestions to substitute the rose petals for a different flower or herb? You could substitute lavender, vanilla beans, citrus zest…lots of options! Where did you get those containers? The balm and the scrub? The lip balm containers are from Michaels, they were actually containers for measuring tapes that I found in the clearance section…I was having trouble finding actual lip balm containers in stores. Amazon however, has tons of options…tubes and pots! The glass containers for the scrub were found at Hobby Lobby, they have lots of cool glass bottles and jars. did you notice the rose petals turning brown then black after a few days? I didn’t have that problem with the petals…they are still the same color months later! To be on the safe side though, you could dry the petals for a few days before using them. Thanks so much! These are beautiful! I have a question though: Did you use yellow beeswax? I want to try this recipe and I want to make sure I get the nice contrast of the white balm against bright flowers. Hi Mansi – you could replace beeswax with berry wax (also called japan/sumac wax), though it might be hard to find. I’m considering making this, but I want to substitute the extract for essential oils. Any advice? I was wondering if the rose petals had a shelf life before they changed color in the balm? Should it be used within a certain amount of time? hey i wanted to know what the recipe would be like if i only wanted enough for 1-2 containers at most? You might try using 1/3 of each ingredient for 2 containers. Thanks for stopping by. Thanks for the post! I just tried the lip balm recipe!! :) I used dried hibiscus flowers instead of rose petals (because Whole Foods didn’t have dried roses :-D) I doubled the recipe and made 12 so I could give some out as Christmas presents! They turned out great!! I would attach a picture if I knew how!! lol Once you apply it though it feels a bit too waxy, and I actually only used 3 oz of beeswax (doubling the recipe called for 4 oz). Do you know why that would be? (maybe not enough shea butter or coconut oil??) But overall great balm recipe !! Thank you so much! I just tried it today and it came out beautifully! I added a bit of lip stick for some color, and instead of rose petals I used orchids, (do to the fact that they were the only thing I had in the house). I’m glad you tried it. Thanks so much for stopping by. + cocoa butter + shea butter + sweet almond. Does anyone know how to prevent fat blooms please? how long does the petals still keep as the same color ? Hi, Shaliny! You can reheat the lip balm a bit and see if that works. I hope this helps! I live in India so the coconut oil will be in liquid form half of the year. How all the recipe will become in solid form? Hi, Manasa! I suppose you’ll want to try the recipe during the months when the coconut oil is solid. I’m sorry I can’t be of more help! I hope you enjoy it. YAY! After searching for lip balm recipes on Pinterest for a lil while here, I’ve finally decided on the recipe to use for my next batch — This is it but modified! I am really excited! And to have a delicious scrub recipe too! Purrrfect. I’m wondering though, I can substitute the Sweet Almond oil with Grapeseed oil, yes?? Also rather than extracts to use essential oil… ?? Hi, Maya! I’ve never tried the substitutions you mention, but I don’t see any reason why not. I hope you like them! Shelf life of the lip balm? Hi, Monica! I would say about three months, but always use your best judgment. I hope you like it! I’m love the coconut and Rose lip balm! I want to try it but beeswax causes a bad reaction to my lips, can I use a substitute for it or can I just leave the beeswax out?